Earlier today, a suicide car bombing was directed at patrolling French troops in the northern Malian city of Gao. Two civilians were killed, while dozens, including several French troops, were wounded in the blast. As French troops were patrolling in the city, two of the column’s vehicles were targeted by a suicide car bomb. French military sources confirmed to France24 that a military patrol of around 30 troops had come under attack in the city. Initial reports were that several French troops had been killed in the attack, but this was later revised. Photos have been circulating online showing French military vehicles destroyed, as well as nearby buildings damaged. 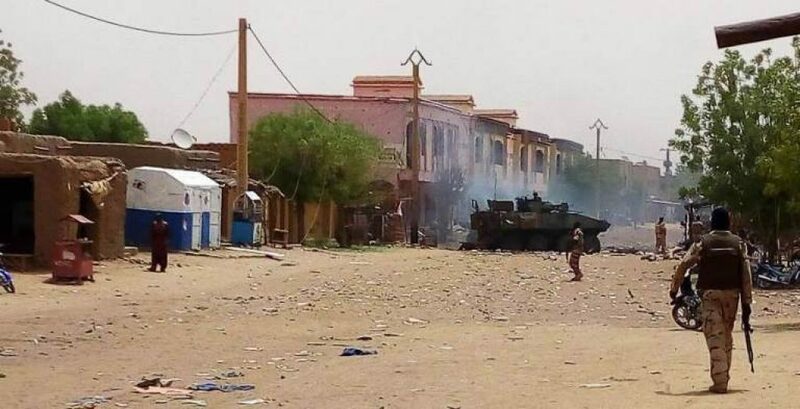 According to the Malian Ministry of Defense, at least two civilians were killed and reportedly another 30 people were injured. At least eight French troops were also injured. No group has yet to claim responsibility for the suicide bombing, however, both al Qaeda’s Group for Support of Islam and Muslims (JNIM) and the Islamic State in the Greater Sahara are known to operate in this area. JNIM and its constituent groups have launched many similar attacks in the past. Additionally, ISGS claimed a suicide bombing on French troops near In-Delimane in Mali’s northern Menaka region earlier this year, which neighbors the Gao region. Today’s suicide bombing comes only days after jihadists targeted the G5 Sahel base in central Mali with a suicide assault. That attack, which was later officially claimed by JNIM, killed three people. The initial death toll was lowered down from six. In its claim of responsibility, JNIM confirmed that the strike involved both a suicide bombing and inghimasiiyeen (suicide commandos). Today’s suicide assault means that there have been at least 135 al Qaeda-linked attacks in Mali and the wider Sahel region since the beginning of the year, according to data compiled by FDD’s Long War Journal. The current number of strikes is on pace to match the pace set in the last few years, despite a French counter-terrorism operation, UN troops, and troops from the G5 Sahel.